The Alberta Weekly Newspapers Association encourages excellence by sponsoring an annual provincial competition to celebrate the achievements of its member newspapers. Newspapers compete against other newspapers of similar circulation for special awards in such categories as editorial, photography, advertising and special promotion. Entry eligibility is for material that appeared in print from January 1, 2018 – December 31, 2018. 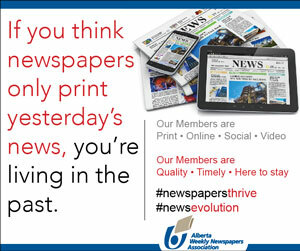 The Better Newspaper Competition - Awards of Excellence is open to AWNA members only. There are no entry fees, however, newspapers entering must be AWNA members in good standing. We're using the same contest entry service that was used last year at the Better Newspaper Contest Website. Instructions on how to log in and manage your account are in the downloadable Brochure and are also posted to KUTD. Contact Maurizia for more information. The BNC competition requires entrants to follow certain guidelines when sending their entries to the contest organizers. DO NOT SUBMIT THE SAME ENTRY IN MORE THAN ONE CATEGORY. This includes articles, photos or ads that have been entered as part of a series or campaign. You may, however submit stories, photos or ads into a stand-alone category if they also appear in a section that has been entered in the Special Sections category. If your entry contains jumps, you should combine your entry into one multiple-page PDF file. Two-page spreads are allowable up to 2 MB. Or you may upload up to five (5) separate PDFs. Please make sure that the order in which they should be read is very clear in the naming structure.